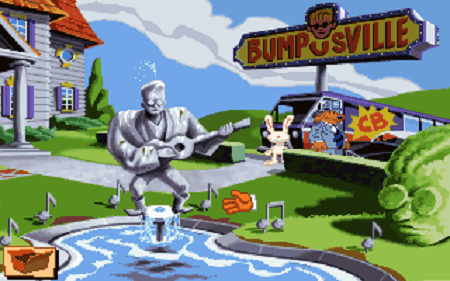 The Gist: Sam & Max Hit The Road is regarded by point n’ click adventure fans as one of the best games that one-time giant LucasArts ever produced. Featuring Sam, a 'canine shamus', and Max, a ‘hyperkinetic, three-foot rabbity thing’ (or a lagomorph, as he prefers to be called), the pair make up the crime-busting duo of the Freelance Police. <i>Hit The Road</i> involves the pair being sent to track down a frozen bigfoot and a giraffe-necked girl - both of whom have vanished from a circus freakshow. This in turn leads them on an epic road-trip across America to save the bigfoot species from extinction. They might also solve the greatest riddle of them all. That being--how do you save bigfoot-kind from an egomaniacal, country-singing Liverpudlian, while armed with nothing more than a dimensional vortex contained in a snowglobe, and a collection of vegetables resembling famous celebrities? Also, they travel to Mount Rushmore and bungee jump from George Washington's nose. 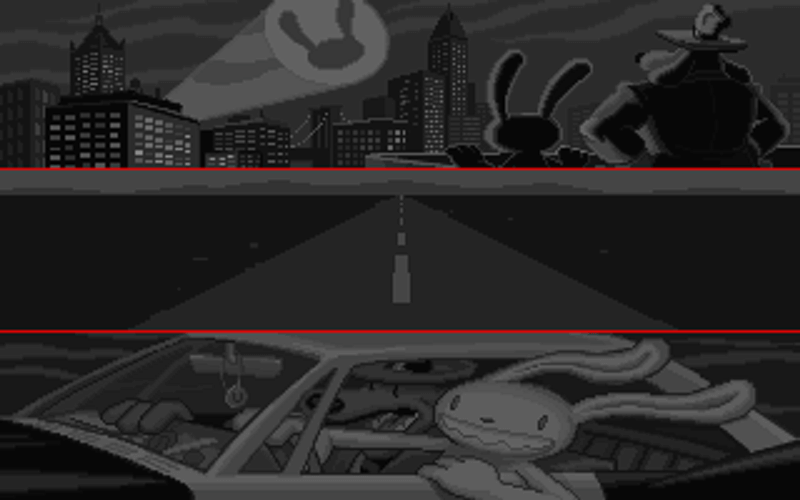 If you know Monkey Island and you know Day of the Tentacle, then it’s practically a given that you know Sam & Max. It’s a name steeped in adventure gaming folklore - a franchise that harkens back to the time when PC gaming was largely DOS-based and pixelated, and ruled by a company called LucasArts. George Lucas’ games division could do little wrong in the early 90s. After forging a name for themselves with the likes of Maniac Mansion and Zak McKracken, they then asserted their dominance with a whole multitude of games focused on their licensed properties. There were Star Wars games and there were Indiana Jones games, and they were mostly very, very good. Mostly. 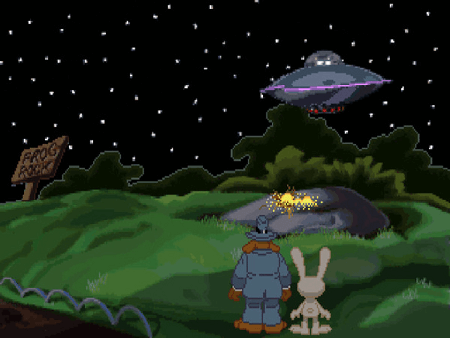 What might not be so well-remembered is that Sam + Max - a franchise far removed from Lucasfilm’s vaunted Hollywood hits - is a licensed property, too. It actually started life as a surreal, incredibly funny comic strip penned by Pixar’s Steve Purcell, who worked as an animator with LucasArts in the 80s and 90s. Inevitably, Steve’s characters ended up getting utilized both as test sprites during game development, and appearing in the company’s quarterly magazine, The Adventurer. At the time, the comic strip itself may not yet have had a cult following outside of the company. But its wacky, often surreal humour certainly resonated with the kind of style LucasArts had come to hinge their games upon. Both Monkey Island and Day of the Tentacle became hits thanks to their comedy as much as their gameplay strengths. Why couldn't Sam & Max, beloved by those in-house, be a best-seller too? It might have been obscure, but it definitely was funny. Its game incarnation proved to be just as much of a hit in late 1993 - and twenty-five years on, it’s still a fantastic jaunt now. Its enduring quality could be down to the simple mastery of the games company producing it. But it could also be down to another factor: it’s still one of loopiest games ever produced. 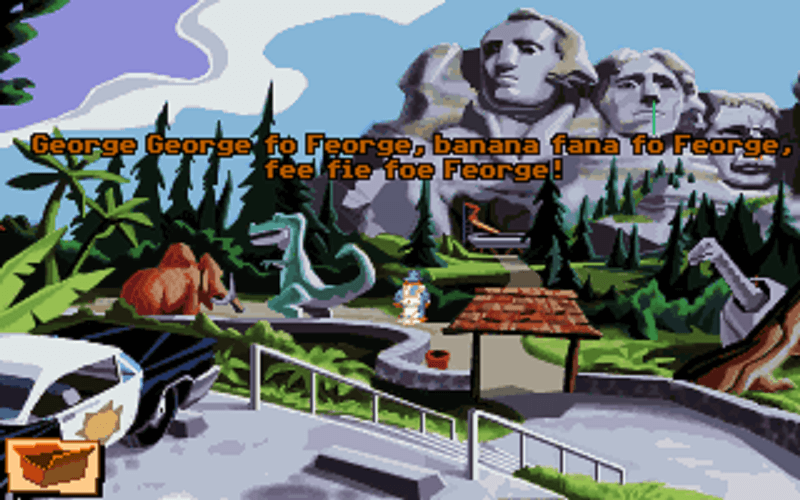 Sam and Max Hit The Road also presents itself as a milestone in a long-neglected game genre - the point n’ click adventure. For the uninitiated reader, gameplay for this genre largely involved guiding a protagonist through a range of different scenes, to solve a range of different puzzles. By using a mouse to point and click around these environments, you could find clues to help you solve these puzzles, advancing the game onward. Naturally, these puzzles became more nefarious - and in Sam and Max’s case, certainly more bizarre - as the game went on. But the sense of reward you got from cracking these challenges was all part of the appeal. And for the vast majority of LucasArts’ titles, being able to enjoy a tremendously engaging story to go with the brainteasers was a nice bonus, too. In Sam & Max's case, much of the charm stems from the game’s two titular characters: a memorable crime-solving duo if ever there was one. Sam, unflappable in a crisis and about as much of a born leader as a six-foot dog in a suit and fedora can be, provides the brains of the partnership. Max, meanwhile, is as deranged as you’d expect from a hyperkinetic three-foot rabbity thing, and provides the partnership with the necessary chaos element. But somehow, the America they road-trip on during their case ends up being even weirder than they are. Besides peppering their investigation with trips to landmarks like the World’s Largest Ball of Twine and the Gator Golf Emporium, they also have to deal with their eventual arch-nemesis - Conroy Bumpus, a raging narcissist with a love for country music, harming animals and talking with an inexplicable Scouse dialect. So grand is his ego, he even gets to sing his own hilarious theme tune toward the end of the game. And that’s just a mere smidgeon of the lunacy - and the hilarity - that this adventure frequently serves up. Seasoned adventure gamers will already be familiar with the mechanics of Sam & Max (if they haven't played it already). Despite the addition of a few daft arcade-style mini-games, this is point n' click through and through. The game uses the LucasArts’ revered adventure game engine - the SCUMM Environment - with some subtle changes added. 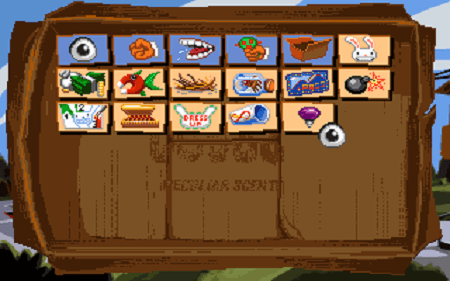 Older SCUMM games used a visual verb-driven menu on screen to direct the characters to perform actions. 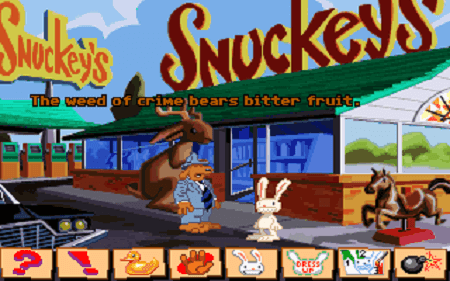 With Sam & Max however, there is no menu to be found - it's all purely scene-oriented. All character actions are instead accessed via keyboard controls, or a slender pop-up menu at the bottom. Accessing your inventory is done via clicking a small icon in the bottom left, which then displays a trunk full of the wanton crap you’ll accumulate during the game’s progression. With more game screen available for the graphics instead of the commands, the result is something that looks bigger and brighter than the company’s previous works - without compromising the overall experience. 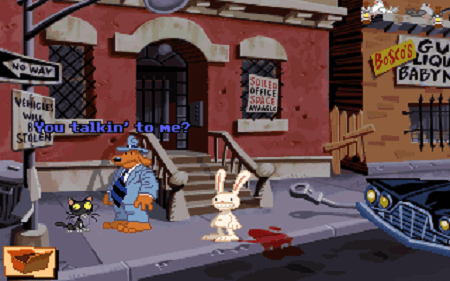 Thanks to the superb in-game dialogue and tremendous voice-acting throughout, Sam & Max is also an absolute hoot, no matter what scrapes its two heroes find themselves in. It’s hard not to love its farcical, fourth-wall breaking humour, and the constant wisecracks that Sam and Max play off of each other still hit the mark two decades on. The graphics may certainly have aged in an era that has embraced HD, but those pixels still can’t keep some solid animation and a surreal 60s cartoon visual style from capturing the original strip’s look perfectly. And while the MIDI score has also aged, it still suits the game’s personality to a tee; its offbeat jazz providing a nice compliment for the gags that are constantly firing off on-screen. Time may have obsoleted its technical achievements, but Sam and Max’s penchant for anarchy and creativity persists. Its presentation is both as hilarious as it is odd - and provides more than enough laughs to keep its puzzles entertaining. Ironically though, it is also in Sam & Max’s love for surreal humour where its one weakness presents itself. The game isn’t just a collection of funny situations stitched together--its problem-solving is its main gamut. In this area of things, the constant zaniness can be just as much of a curse as a blessing. It simply refuses to let up, especially late in the game. And while that means that the comedy never ceases, it also causes the challenges Sam and Max are faced with to become increasingly obscure. Progressing past some of them can be a frankly baffling process. It’s all well and good collecting an inventory full of curious and amusing junk - and some of it can be used for ingenious purposes. When a game constantly hands you punchlines of the quality that this one does, it’s easy to overlook the occasional flaws within its mechanics. 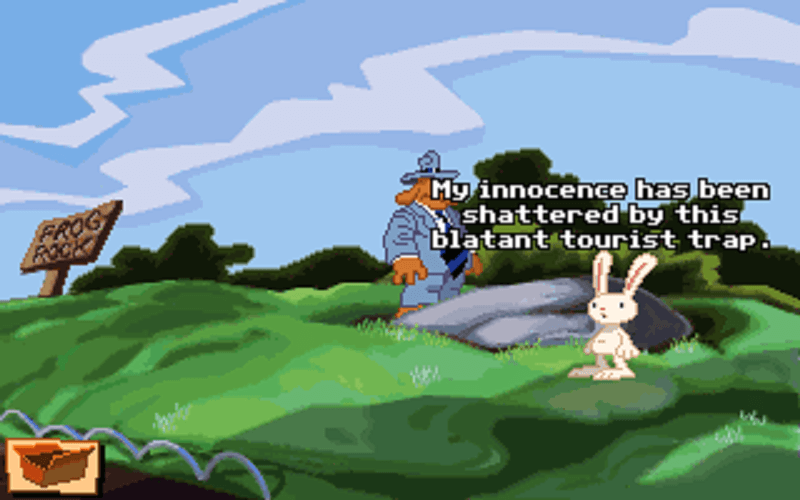 Incredibly funny and aesthetically timeless, Sam & Max Hit The Road is still a joy to play. It's not just a shining example of how great the golden age of adventure games was either. Going on to inspire a spin-off cartoon series, cult acclaim for its original comic strip and a number of equally enjoyable episodic sequels (produced by Telltale Games), it also has a legacy that speaks for itself. None of it beats the original game, though. This is adventure gaming at its finest. Hunt down a copy and take a trip with it today.